After discussing grasslands birds in the last three columns, I decided to go back to our backyard. Although things are generally humdrum at this time of year at our place , but from time to time things do get quite interesting on the birding front. Such has been the case recently. For the last couple of weeks we have had a pair of Brown Thrashers seemingly living in our backyard. 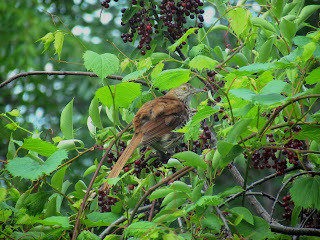 Now Brown Thrashers are not scarce by any means, but are usually overlooked because of their habit of feeding on the ground in heavy thickets and very few urban yards provide the necessary habitat. With this year's rains the thickets in our backyard are quite lush and seem to appeal to the thrashers. Even so, the pair in our yard do not seem to be quite so secretive thus providing us with some good birding. We have seen them preening and sunning themselves (and eating a few chokecherries) while perched in our chokecherry tree. At other times we have observed them chasing after insects on our lawn. One interesting characteristic of all thrashers is that they are all good runners especially when running from one hiding place to another. The several different species in the American south run with their long tails held up in the air. The Brown Thrashers run with their heads stretched forward and their tails straight back like a Road Runner (see Art. No. 61) or a two legged dinosaur chasing after prey. I tried to get a picture of a running Brown Thrasher for this article but they were too quick. Brown Thrashers belong to a family of birds called mimids (birds that mimic other sounds). Although related to Mocking Birds and Catbirds, both good mimics, thrashers almost never mimic any other sounds. However, like all mimids they are good songsters and are especially vocal during courtship. Brown Thrashers are robin-sized birds but longer and more slender with long down curved bills and yellow eyes. Their white breasts and bellies are heavily streaked with brown; the backs and tails are a bright rufous brown; the head is brownish grey. Males and females are the same. 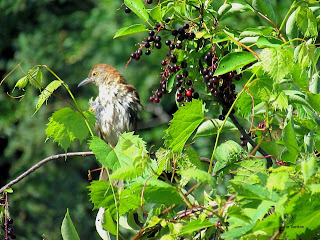 This week's picture shows a Brown Thrasher preening and sunning himself while the second photo shows another thrasher (perhaps the same one) sitting in a chokecherry tree helping himself to some fruit which they eat only occasionally. The pair in our yard were quite confiding and often came within a metre or two of us as we were sitting in the yard enjoying the warm weather. I have seen this pair in our neighbours' yards and could very easily be in just about anybody's yard so be on the lookout for this most interesting bird.